GET YOUR FREE E-BOOK by Edie Bayer! 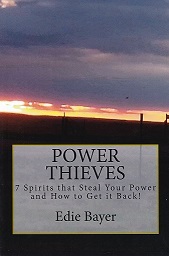 "POWER THIEVES - 7 Spirits That Steal YOUR Power and How to Get it Back!" Sign Up Today for Edie's Mailing List, Get this Book FREE and Get ALL of Edie Bayer's Prophetic Words FIRST Before they go public! Stay up to date on all of Edie Bayer's Events! Enjoy unpublished Words and EXTRAS that are only available to subscribers! Sign Up Today!